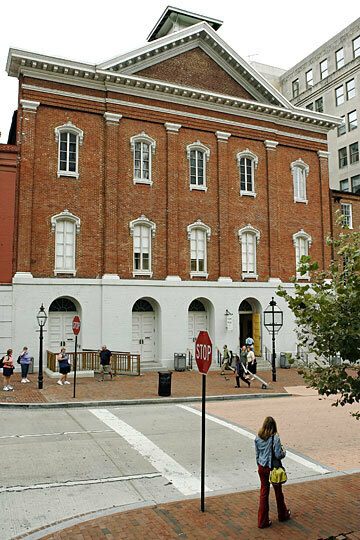 Ford's Theatre: The Lincoln Assassination Revisited To mark the 200th anniversary of Abraham Lincoln's birth, NPR spoke with historian James Swanson about the final moments of Lincoln's life and about his assassination by John Wilkes Booth. 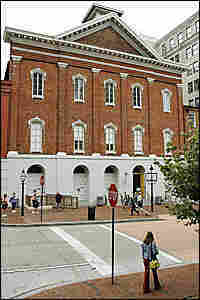 They toured Ford's Theatre in Washington, D.C, where Lincoln was shot in 1865. Petersen's Boarding House, circa 1900. 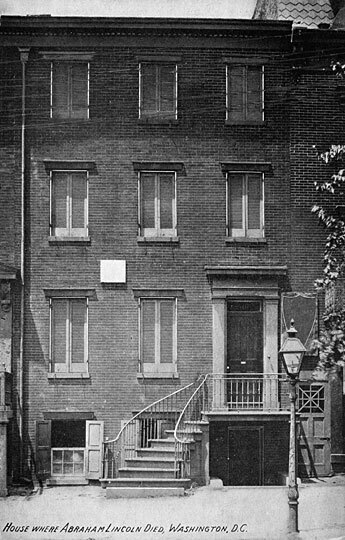 Lincoln was brought here, across the street from Ford's Theatre, after he was shot. He died of his injuries on the morning of April 15, 1865. Ford's Theatre, seen in 2006, stands on the east side of 10th Street NW, between E and F streets in Washington, D.C.
Ford's Theatre, seen in 1863. President Abraham Lincoln was shot here on April 14, 1865. "I was born on February 12, 1809, in Hardin County, Kentucky." Two hundred years later, Lincoln is remembered as a great president whose life was marked by America's war with itself, and whose death came just as peace was at hand. "Six hundred thousand Americans had died in the Civil War," says James Swanson, who has written two books about Lincoln's death. "That war was finally coming to an end. Lincoln had freed the slaves. He had ended secession. There would be no more dying. And Lincoln was filled with joy." To follow the story of Lincoln's assassination, NPR's Renee Montagne accompanied Swanson to Ford's Theatre in Washington, D.C. In the spring of 1865, the city was celebrating the coming end to a long and bloody war. "Cannons, fireworks, torches, parades, people getting drunk in the streets, children running around carrying little flags: 'Victory is ours,' 'Richmond has fallen,' " says Swanson of the celebration. "Amidst all this joy, there was one man in Washington who was not happy at all, and that was the famous actor John Wilkes Booth." Booth was a Confederate sympathizer who had plotted with others to kidnap Lincoln — a plot that had come to nothing. 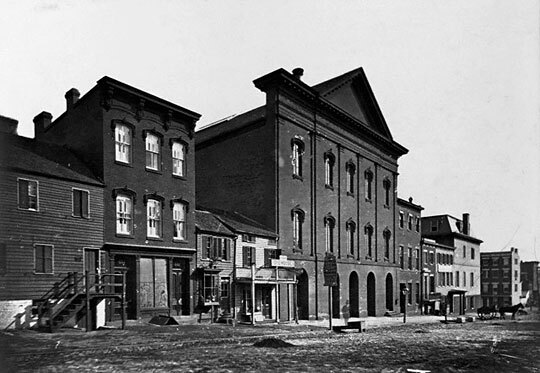 But on the morning of April 14, 1865, when Booth was reading his mail on the front steps of Ford's Theatre around noon, he heard the president was coming to the play that night, Swanson says. "That's the moment he decided to kill Lincoln." James Swanson has written two books about the assassination of President Abraham Lincoln. You can read excerpts from both below. Just hours later, the actors came on stage to perform the comedy Our American Cousin. 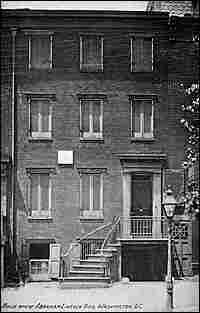 "And [Lincoln] came up these stairs with his guests. When he arrived, the audience finally realized the president was here, and so the orchestra broke into a performance of "Hail To The Chief," and the actress suspended the play and made a tribute to Lincoln. And it's up this very same route that Booth came. With full view of the stage, full view of the performance, the sound of the theater, the laughter — and then Booth stopped. "If his box had been guarded properly, he could have said, 'I'm John Wilkes Booth — I want to greet the president,' just the way a famous actor today might be able to greet the president at an important public event. "One of the great mysteries of the assassination story and the whole Civil War is, why didn't Lincoln have proper guards? Lincoln was a fatalist. He thought, 'If someone wants to kill me, nothing can stop them.' After he was shot, over 100 death threats were found in a cubbyhole in his desk — he knew he was a target. "Booth waited in a dark space in the president's booth, listening to the dialogue from the play. He waited until one actor was left on the stage — Harry Hawk — who was about to say a funny line that was going to make the whole audience erupt in laughter, which Booth hopes will muffle the sound of the shot. "Booth has, in his left hand, his bowie knife. In his right hand, he clutches the derringer pistol. He hears that line, and he levels his right hand and almost touches the back of Lincoln's head with the derringer pistol, and fires. "Everything froze. And that smoke from the black powder weapon filled the box, and the box took on a very devilish red color because of the artificial lights and the gas lamps and the smoke, which was voluminous from the black powder weapon. Then, one of Lincoln's two theater guests, Maj. [Henry] Rathbone, an Army officer, realized that was a gunshot. He rose up to grapple with Booth, and as soon as Rathbone looked up, he could see that knife coming down to kill him. Rathbone got his arm up just in time to parry the blow but endured a deep cut. "Booth sat on that balustrade; he swung one leg over, then the other; he jumped to the stage — about an 11-foot drop — then Booth ran to center stage. This was his final and greatest performance on the American stage. So he raised his bloody dagger in the air and cried out the state motto of Virginia, 'Sic semper tyrannis — thus always to tyrants.' And then he cried out, 'The South is avenged!' And just as he exited from the stage, he was heard distinctly to say: 'I have done it!' And then he vanished into the wings." With Booth leading what would turn out to be a long chase into the countryside, President Lincoln was carried to the street, where a huge crowd had quickly collected. "The bed was too short, and his legs reached over the end of the bed. The doctor said, 'Break the footboard off so the president can lie in the bed.' It wouldn't come off, so the president had to be laid diagonally across what became the deathbed." Abraham Lincoln died at 7:22 the next morning. "A little while later, soldiers rounded the corner carrying something, and that's when the thousands of people standing on the street maintaining the death vigil let out a wail," Swanson says. "Because that was the final refutation of their hopes. When they saw that box — it wasn't even a proper coffin; it was an ammunition crate or a rifle case — they carried that box up the stairs, they wrapped Lincoln's body in the American flag, and then lowered him into the coffin. And witnesses say the only thing you could hear in that death room was the squeaking of the screws being tightened." Swanson says Booth had several motives to kill Lincoln, including avenging the South, to inspire the Confederates to keep on fighting, and to win fame and glory for himself, which is why 12 days later, when he was wounded and trapped by soldiers in a barn, he walked into gunfire to his death.